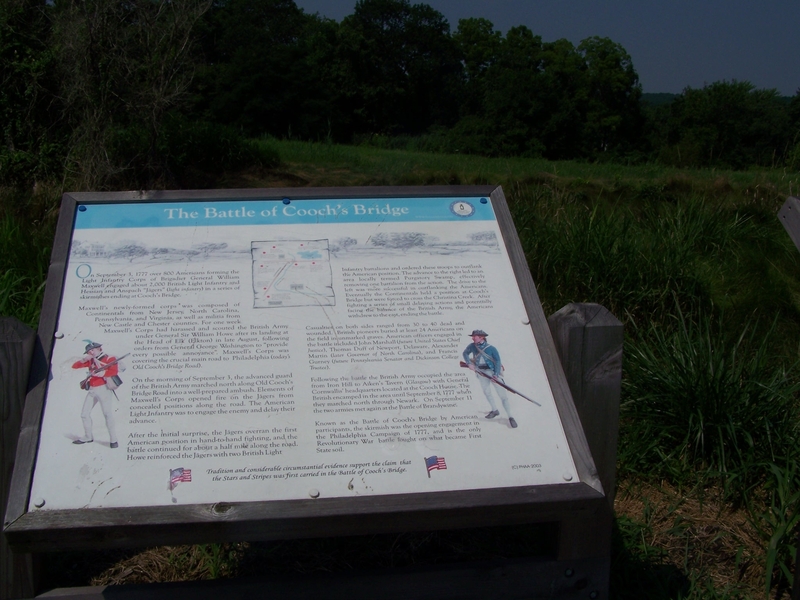 The September 3, 1777 battle of Cooch’s Bridge between Brigadier General William Maxwell’s corps of light infantry (which consisted of 100 men from each Continental brigade, as there was no Continental light infantry at this time) and a combined force of the 2nd battalion of light infantry (a composite British force made up of the light companies of several regiments), German jaegers and hat companies, and British artillery was a major skirmish prior to the battle of Brandywine, and the only significant battle to take place in Delaware. On Tuesday, September 2, 1777, General William Howe was at Grey’s Hill, Lieutenant General Wilhelm von Knyphausen was stationed at Buck Tavern, also called Carson’s, (south of Summit Bridge), Major General Charles Grey was at Lum’s Pond, (then called Mill Dam). General George Washington reconnoitered around Mill Dam but did not see any troops and wrongly believed that Knyphausen must have rejoined Howe. I do not know where the Sign of the Buck is, I therefore cannot say whether it will be proper for you to leave your present post to go and attack the party that is said to be thereabouts. If it is upon your left as I suppose it is it will be by no means proper, because while you were gone down, the enemy might advance from Grey’s Hill to Christeen and cut you off from us. General Caesar Rodney was at Noxontown with about 370 Kent County militia. He knew the enemy were moving toward Christiana Creek and wanted to cause them some trouble. He wrote to Washington that he: “kept his light horse, about 17 or 18 in number, out beating up the enemy’s quarters, and gaining what intelligence he could of the enemy’s movements.” Rodney’s men exchanged shots with the enemy around Buck Tavern, alarming the whole camp; but he and the Delaware militia had no part in the Battle of Cooch’s Bridge. 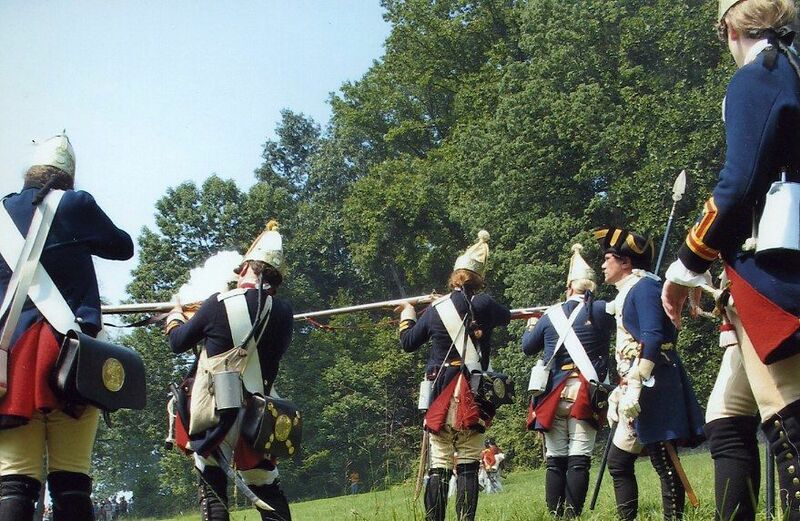 The following morning, Wednesday, September 3, 1777, was cool; but the afternoon was excessively hot, as some American troops were reconnoitering around Aiken’s Tavern. They left before British troops arrived in the area. Maxwell stationed his troops all along the road between Aiken’s Tavern and Cooch’s Bridge. After resting and refitting at Head of Elk for over a week, Howe divided his army into two divisions under Earl Charles Cornwallis and Baron Wilhelm Knyphausen. 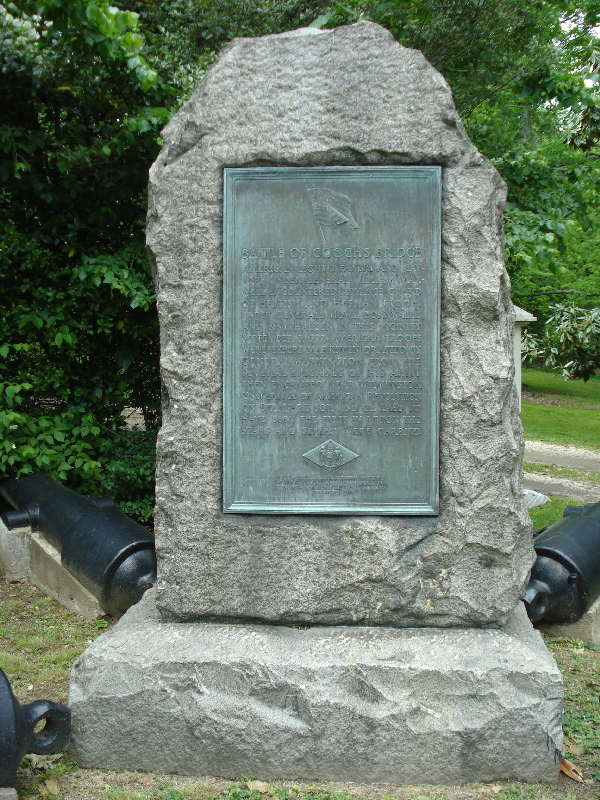 Howe accompanied Cornwallis’s column, which advanced from Head of Elk and reached Aiken’s Tavern, in what is now Glasgow, DE, about 9:00 AM. Knyphausen division, marching from Cecil County Courthouse, arrived an hour later. Cornwallis’ division, having arrived earlier, proceeded first on the road north from Aiken’s Tavern toward Cooch’s Bridge and Iron Hill. Just a mile north, the vanguard of German jaegers under Lieutenant Colonel Ludwig Johann Adolph von Wurmb encountered outposts of General Maxwell’s light corps. This ad hoc formation had been thrown together to replace Colonel Daniel Morgan’s valuable riflemen, sent some months earlier to aid Major-General Horatio Gates in New York. I had the corps form on the right and attack. The captain on the right wing found an opportunity to fall upon the enemy’s flank. After the enemy had shot themselves out of ammunition the fight was carried on with the sword, they being finally put to flight. But they immediately made a stand again and we drove them away the second time when they took post beyond Christeen Creek at Cooch’s Bridge. Here the second battalion of light infantry came to our assistance. Howe ordered a simultaneous advance on both flanks of the enemy. On the American right, the attempt of Lieutenant-Colonel Robert Abercromby’s light infantry got entangled in the woods and bogged down, in what was known as “Purgatory Swamp,” advancing no further. On the left, Captain Carl August von Wreden with a body of Hessian grenadiers succeeded in gaining the American flank and “cannonaded [them] with some amusettes and charged with bayonets,” driving the Americans back in disorder. Major John André wrote, “their flight afterwards became so precipitate that great numbers threw down their arms and blankets.” Accounts of casualties vary widely, but probably approached thirty British and sixty Americans. What was intended to be little more than a delaying action had turned into a bloody skirmish. The initial tenacity of the Americans, as well as their propensity to break when pressed with the bayonet, was a portent of things to come. 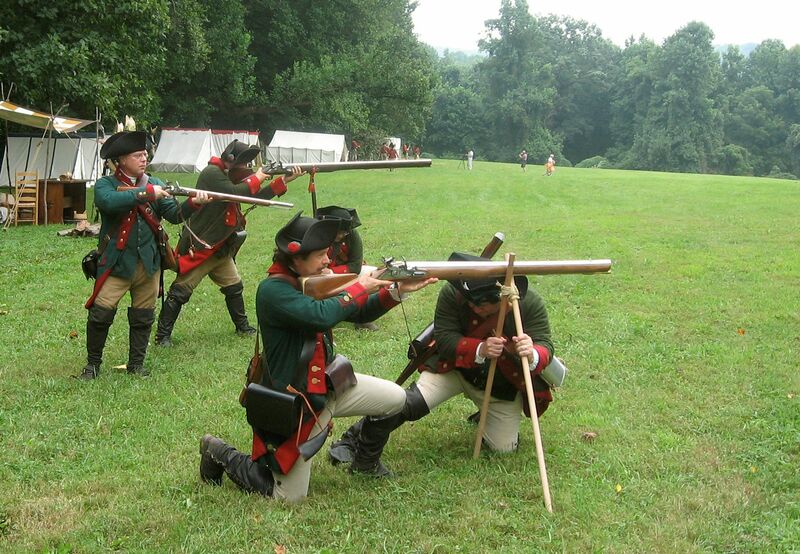 The Americans retreated to rejoin the main army at White Clay Creek. They were pursued about two miles. The British and Germans then returned to Cooch’s Bridge and Iron Hill. The Spirite’d Manner in Which Lt Colo Wormb & the officers & Men yesterday Engaged Defeated the chosen Advance’d Corps of the Enemy, Desires the highest Encomicum’s & Calls for the Genl’s Fullest Acknowledgements. Upon reconnoitering their situation, it appeared probable that they only meant to amuse us in front, and by suddenly passing the Brandywine, get between us and Philadelphia. To prevent this, it was judged expedient to change our position immediately. The army accordingly marched at two o’clock this morning (September 9), and will take position this evening upon high ground near Chadd’s Ford. Septr 3d This morning about 5 O’Clock The Lt Infantry, Grenadiers, Hessian Chasseurs, Queens Rangers, some battalions of Brittish and Hessians, march’d under the Command of Sr Wm How, to take possession of they Iron Hills. 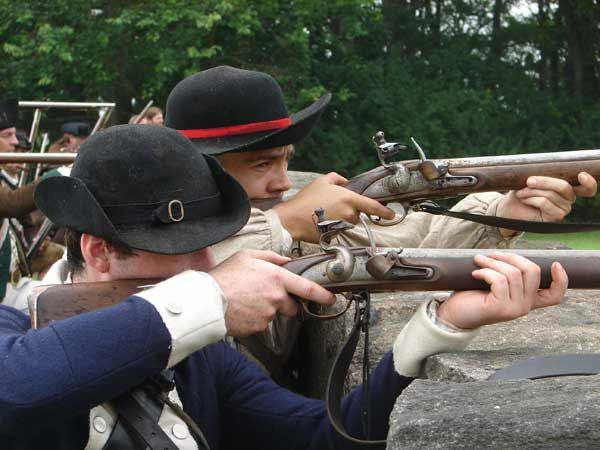 About 8 O’Clock ye Hessian Chasseurs, and 2d Battalion of Light Infantry, attack’d a large party of the Rebels, strongly posted at a bridge, at the foot of the Iron hills ; which after a faint resistance, was carried with very little loss. The Rebels had about 50 kill’d, and Wounded ; The 1st Battalion of Light Infantry endeavouring to turn the left flank of ye Rebels, and cu[t] off their Retreat, was prevented by an Impassable morass, which ye Guide was not acquainted with. At this pass there was 500 Regulars, and 300 militia, under the Commd of Genl Maxwell. Tomorrow morning, by five o’clock, camp must be broken and the regiments must be at the front ready to march. The old pickets will have been previously withdrawn. The new pickets of the English regiments will make up the vanguard and take along two of Lieutenant Willson’s 3-pounders; then will follow the English dragoons, except for that one non-commisioned officer and six dragoons who will march at the head of the pickets; then all the quartermasters and officer’s men from the battalions of the 71st Regiment; then the 3rd, (15th, 17th, 42nd, 44th Regiments) and 4th (33rd, 37th, 46th, 64th Regiments) English Infantry Brigades by half companies; then the Hessian Leib Regiment, Mirbach’s Regiment, the combined battalion (the Fusilier Battalion Loos, the remnants of Rall’s Brigade) and half of von Donop’s Regiment, then the baggage (the wagons of the generals first and the rest in the same order as the regiments). The baggage will be followed by the cattle, and the guards assigned to it will keep the drovers in order. The Hessian pickets will patrol along both sides of the baggage and cattle train, keeping particularly close watch on the right, Lieutenant Colonel Heymell (Carl Philipp Heymell) will form the rear with the other half of von Donop’s Regiment, which is to be preceded by Lieutenant Willson’s two remaining 3-pounders. Everyone is warned against setting fire to houses, barns, or other buildings along the line of march. At each building a double post will be left, which is to be relieved by each successive battalion until the rear guard. In addition, one officer and fifteen dragoons will follow the rear guard. The spirited manner in which Lieutenant Colonel von Wurmb & the officers and men yesterday engaged & defeated the chosen advance corps of the enemy deserves the highest encomiums & calls for the General’s fullest acknowledgements. The 3rd – We marched out of our camp at four o’clock in the morning. At a distance of two and one-half miles we entered Pennsylvania and shortly thereafter encountered and enemy corps of 3,000 men in the region of Wellstreg, or the Fort Euren Kill, or Katschers Mill (Gooch’s Mill). The enemy stood firm. The fire was extremely heavy and lasted about two hours. Only our corps (i.e. the jaegers) was engaged and a few English. The enemy attacked three times. We lost one dead and ten wounded, while the rebels suffered nearly fifty dead and, according to the deserters, very many wounded. We made few prisoners. Our jaegers conducted themselves well and, after the enemy was driven back, we entered camp during the afternoon not far from that place. The affair began at eight o’clock and lasted until ten. The company had two wounded, a corporal and a jaeger. …the Country is close – the woods within shot of the road, frequently in front and flank and in projecting points towards the Road…A Continued Smart irregular fire [ensued] for near two miles. I…had not gone a hundred paces from the advance guard, when I received fire from a hedge, through which these six men [the dragoons] were all either killed or wounded. My horse, which normally was well used to fire, reared so high several times that I expected it would throw me. I cried out, “Foot jagers forward!” and advanced with them to the area from which the fire was coming…At this moment I ran into another enemy party with which I became heavily engaged. Lieutenant Colonel von Wurmb, who came with the entire Corps assisted by the light infantry, ordered the advance guard to be supported…The charge was sounded, and the enemy was attacked so severely and with such spirit by the jagers that we became masters of the mountain after a seven hour engagement … The majority of the jagers came to close quarters with the enemy, and the hunting sword was used as much as the rifle … The jagers alone enjoyed the honor of driving the enemy out of his advantageous position. …after a hot fire the enemy retreated towards their main body, by Iron Hill. They made a stand at the Bridge for some time, but the pursuing Corps made them quit that post also, and retire with loss. September 3: “This morning the Enemy came out with considerable force and three pieces of Artillery, against our Light advanced Corps, and after some pretty smart skirmishing obliged them to retreat, being far inferior to them in number and without Cannon. The loss on either side is not yet ascertain’d. Ours, tho’ not exactly known is not very considerable; Their’s, we have reason to believe, was much greater, as some of our parties composed of expert Marksmen, had opportunities of giving them several close, well directed Fires, more particularly in one instance, when a body of Riflemen formed a kind of Ambuscade.They advanced about two Miles this side of Iron Hill, and then withdrew to that place, leaving a Picket at Couch’s Mill about a Mile in front. Our parties now lie at White Clay Creek, except the advanced Pickets, which are at Christiana Bridge. 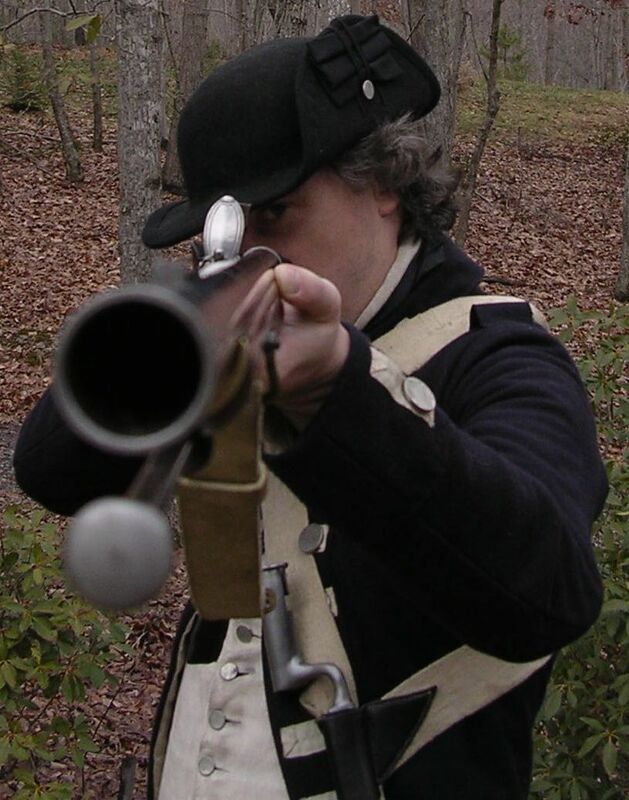 But passing over many interesting circumstances, from the above time to the latter part of August 1777, went on our march to meet the enemy in the State of Virginia as we supposed we were met immediately after passing Chester with an express that the enemy was landing at the head of Elk [River]. At this place 8 hundred men chiefly volunteers called the detached light infantry I being among them the following are the names of the field officers commanding this party, Rich. Parker [Lt. Colonel Richard Parker, 2d Virginia Regiment] , Colonel Heath [probably Willam Heath] with a glass eye Colonel Crawford [perhaps William Crawford] with his leather hunting shirt, pantaloons and Rifle, Colonel Martin [perhaps Alexander Martin] from North Carolina, General [William] Maxwell being the commander we marched to a place called Iron Hill where we remained until the 2nd of September, the enemy being as yet stationary when a very bloody conflict ensued. As no historian has noticed this I refer you to Washington’s Official letters. For myself I can say that this detachment on that day deserved well of their country. This entry was posted in 1777, Cooch's Bridge, Delaware. Bookmark the permalink. What a great post! The extracts from primary sources are terrific, and whoever is taking the photos has real talent. Two of the sources are unfamiliar to me: the Stirke journal and the anonymous British journal. I didn’t see in the post where the latter was published. I would be interested in knowing about it if you have the information and can share it. Many thanks! There is a reference to Noxontown. Was that near the present day pond by that name, near St. Andrews School ? very well done and the best info so far.